Afternoon tea is tempting enough as it is, but when all things chocolatey are thrown into the mix, well how could I resist? My mum’s birthday was just the excuse I needed – birthday present for mum, chocolate for both of us. It’s a win win situation. 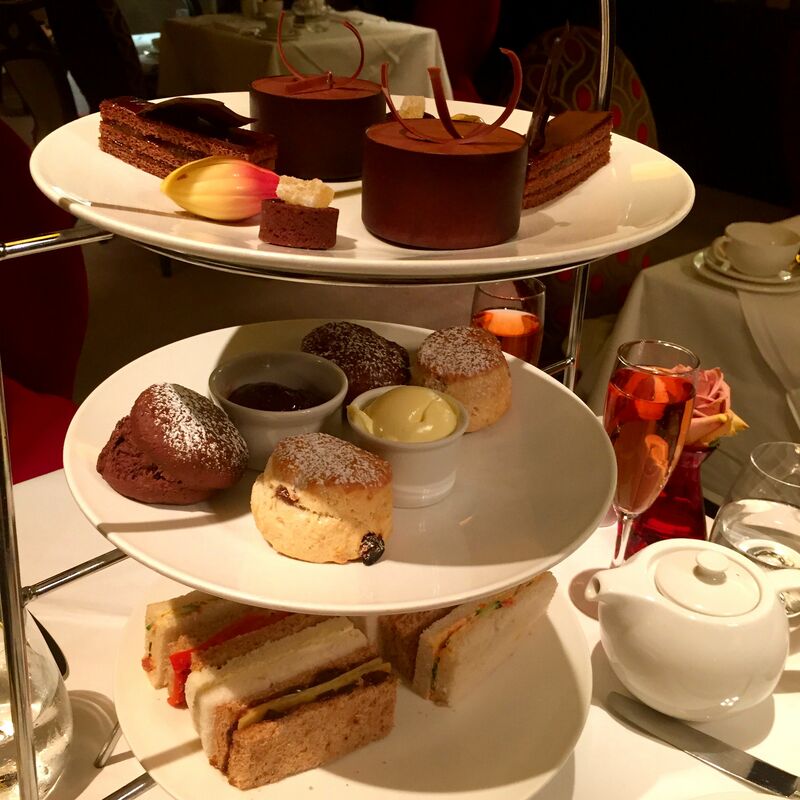 After a thorough search of all the chocolate afternoon teas that London has to offer, Flemings Mayfair seemed like the best choice purely because of the scrumptious looking array of chocolate coated desserts they provided AND chocolate scones. Not just plain scones with chocolate chips, but proper full on chocolate scones. I just had to give these a try. 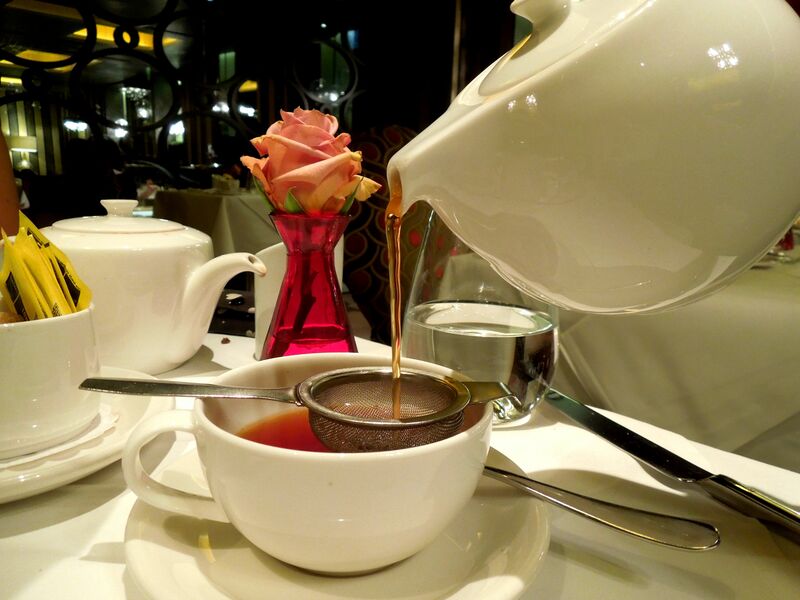 It didn’t take us long to decide whether to start with a pot of tea or pink champagne first (obviously the champagne won), before three tiers of mouth-watering deliciousness appeared at our table. 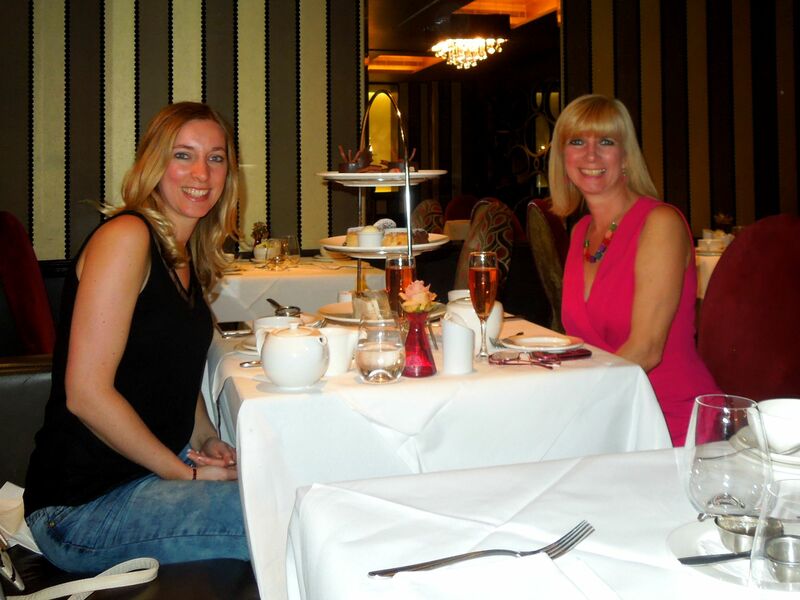 After the obligatory photos (mother included – she’s almost as bad as me and she doesn’t have a blog! ), we dug into the bottom tier of sandwiches even though our eyes kept straying to the top chocolate tier. 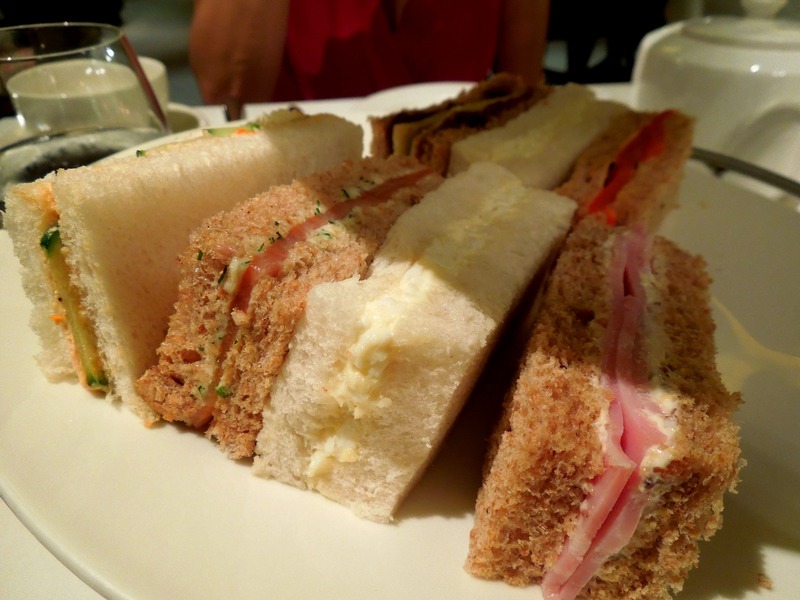 The sandwiches were standard finger sandwiches made with a mixture of white and brown bread. The vegetarian choices for mum were pretty good with a red pepper and hummus slice that almost made me wish I’d gone for the veggie option. Almost, but not quite, as I’d never give up my smoked salmon. Who pinched a sandwich before photos?! Mum has a bit of a scone obsession – she has one for breakfast, without fail, every single morning – but she still dug into these ones like she hadn’t had a scone in years! We’re both fans of the simple plain scone but the chocolate ones were amazingly tasty. Still with that soft and fluffy freshness but with an added sweet chocolatey kick, not forgetting big dollops of clotted cream and jam on top of course. After much stuffing of our faces we were already so full but we had finally made it to the best tier and we weren’t giving up yet. It was bursting with chocolatey treats including chocolate layered sponge slices, dark chocolate mousse, chocolate orange ganache beans and chocolate ginger drops. So. Much. Chocolate. Desserts bigger than mum’s head! But the masterpiece of the show was the dark chocolate mousse. And oh my gosh there are no words for how amazing this was but I’ll attempt to describe it for you as long as you try to keep drooling to a minimum please. The hard outer chocolate shell held the mousse like a bowl and we dipped in for a spoonful finding a centre of fruity strawberry jam nestled inside. 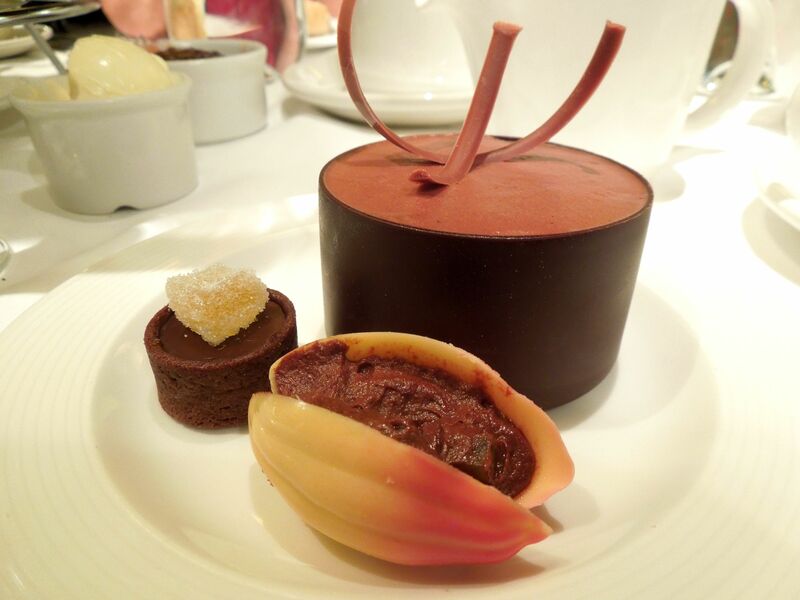 The chocolate mousse was dark, soft, bubbly, creamy and rich – everything the perfect chocolate mousse should be – and the outer shell cracked and melted in our mouths. It was heavenly. It was amazing. And I could have eaten 10 more if I had any room left in my belly. Okay I’m sure I couldn’t have eaten one more to be honest as they were so rich and filling, but I really really wanted to! 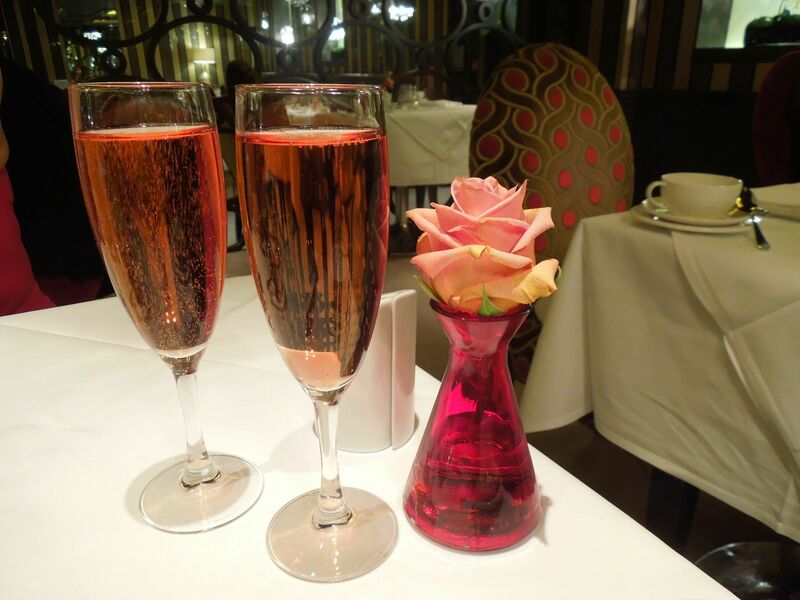 We only had a couple of small quibbles when they brought us the wrong champagne (but this was quickly changed) and we didn’t get the bread we’d pre-ordered. All other requests – one vegetarian and one nut allergy (because we like to be awkward) – they had no problems catering for. They even asked us if we’d like more sandwiches or scones. Thank you but there was no way were we fitting anything else in! A fair few times we looked at the other diners around us with smugness filling our bellies because our chocoholic tea looked SO much better than the normal afternoon tea that everyone else had (haha suckers!). Not to say that the normal afternoon tea isn’t nice, but our chocolate covered tiers just looked a whole lot better. Barely able to move from all the food, we went home in a chocolate-induced stupor that would last for days. Okay, maybe not quite days; more like a few hours until later that evening when we dug into our prettily wrapped goody bags for more. Oh my mum is now your number 1 fan Angie well done haha! They were such yummy scones Vicky. I’m craving some now actually just thinking about it! Chocolate afternoon tea! Wow! I’ve never thought of making chocolate scones, loving the idea of cream on one of those! I might make some then! Nom nom! 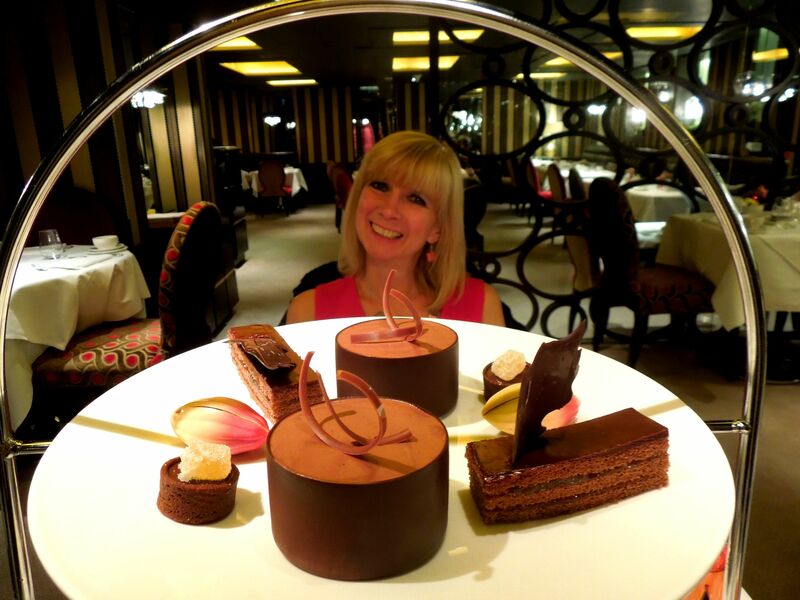 You have to try a chocolate afternoon tea Andrea. So delicious! Preferably this one purely because of that mousse. Amazing! Hey, afternoons are MADE for photos 🙂 What a lovely way to spend Mother/Daughter time! Ahh Ayla this looks incredible! 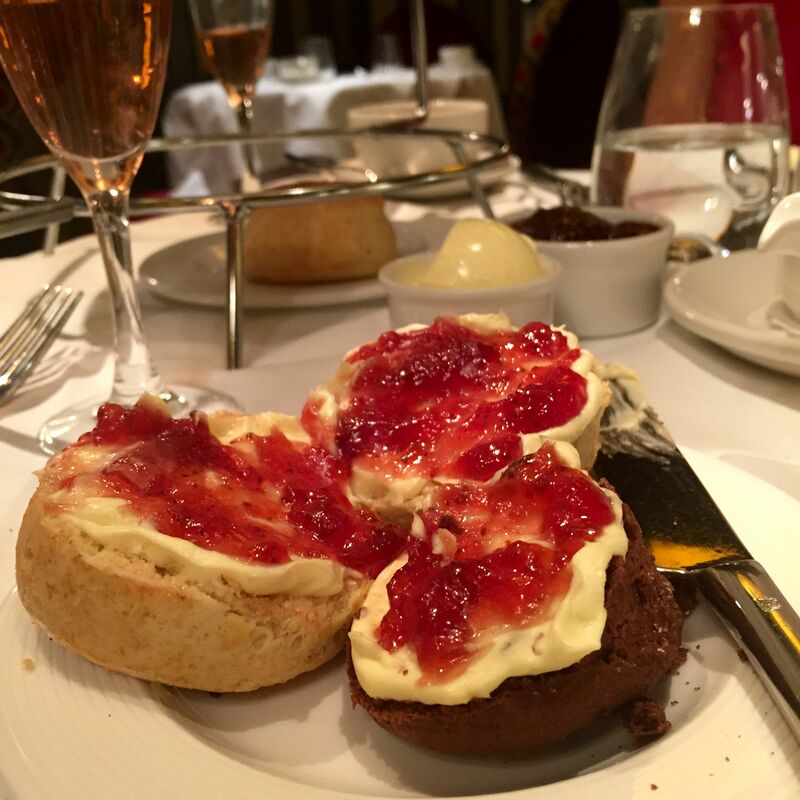 You had me sold at chocolate scones, pink champagne and chocolate mousse…! It was sooooo delicious Lauren! Whoops, I just read this on an empty stomach! Looks divine!! And your mum and you look super glam. Sounds like the perfect mother-daughter time. ok just looking at the photos i need sugar now!